2013 was the first year that Greerton Villagers attempted to yarn bomb the cherry blossom trees throughout the village. 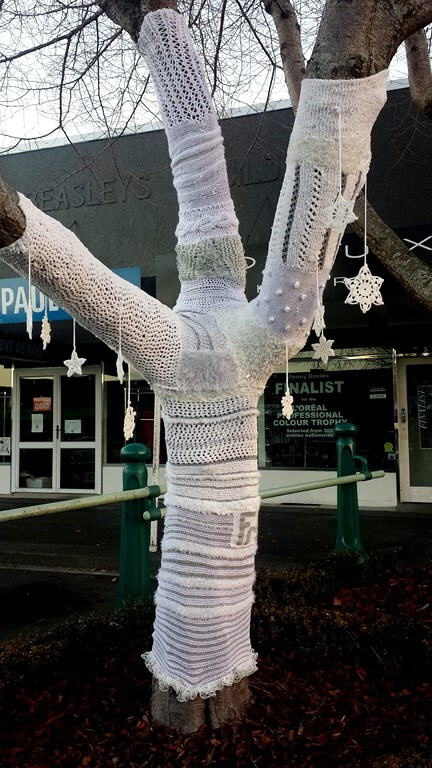 A covert operation including members from the public of all walks of life and abilities, knitters crocheters, weavers and wannabees gathered to create their woolly masterpieces. What started as an idea lead to new skills being learned, great yarns spun and new friendships kindled. 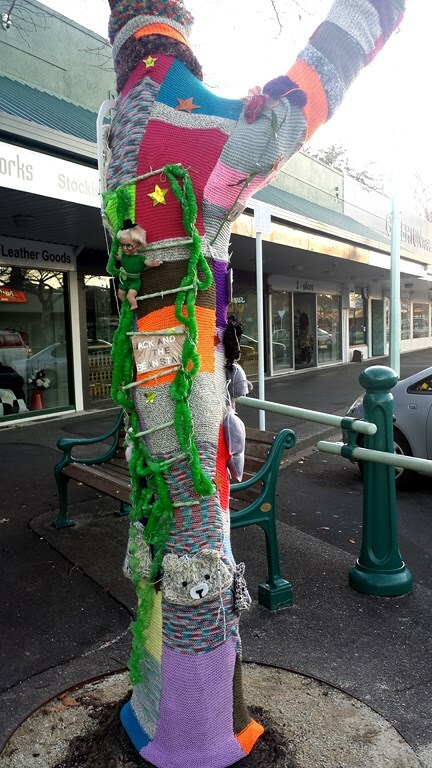 The project grew from an initial 5-6 trees to a whopping 17 yarn bombed creations being installed. The reaction from the public and the press was staggering and our little village was thrust under an enormous colourful spotlight. Visitors came in their droves to view the zany creations, we witnessed complete strangers engaging in conversations on the street, for if a tree wearing a sock doesn’t draw comment then what will? 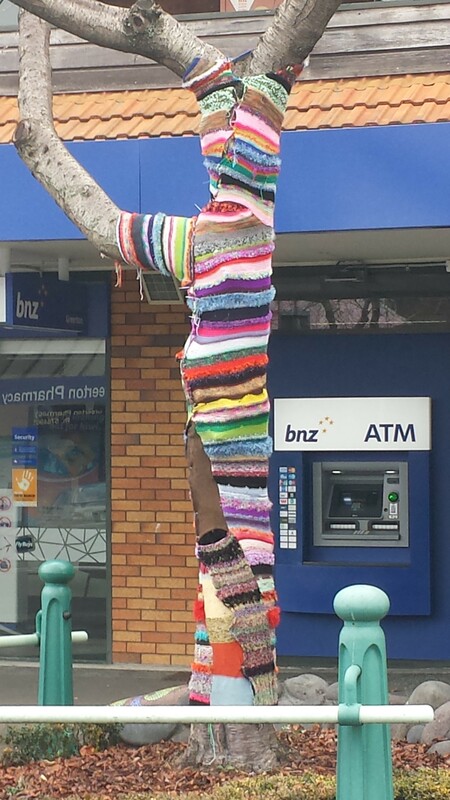 Of course as is the nature of public art, it created a reaction, brought to the surface social issues, like “what a waste of wool” “and why are these people dressing trees when we have freezing children on our doorstep”. For most involved they will agree this project is a welcome deviation from knitting booties and bonnets, to be a part of an art project that draws out a grin. 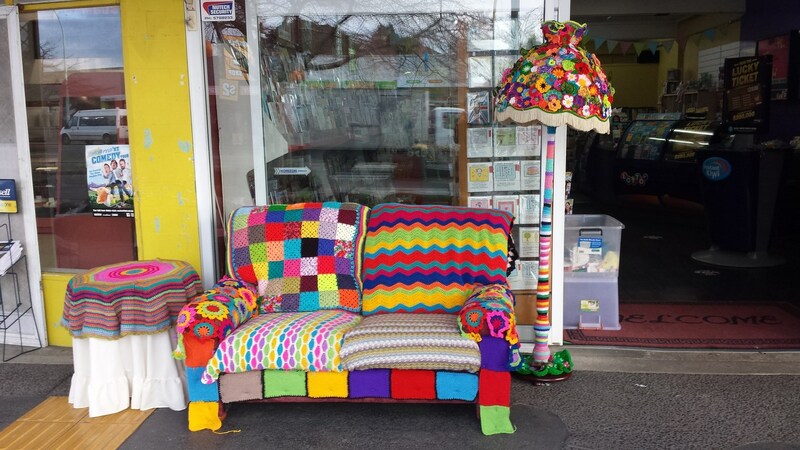 Thank you for viewing our 2014 yarn bomb collection, we all sincerely hope that you enjoy them and that they bring a smile to your face and even better, evoke a flutter of joy in your heart. Location - 136 Chadwick Road. 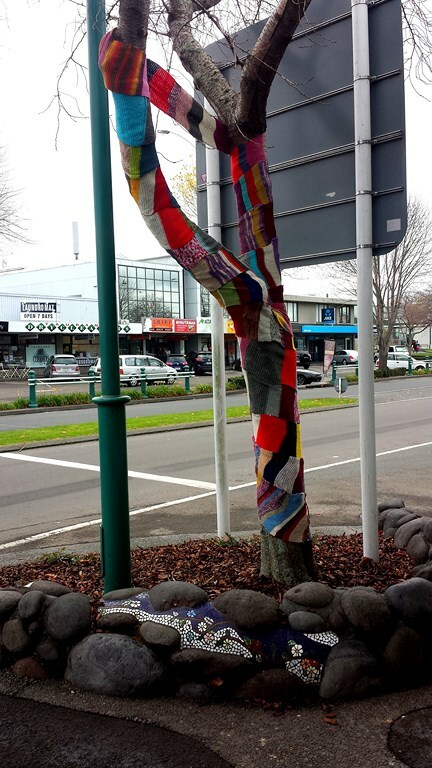 How did you get involved in the Yarn Bombing Project? I jumped at the chance last year when I saw the Yarn bombers advert. At what point did you realise that this is madness and you could very possibly be a bit mad? EXACTLY! Have you ever done anything like this before? I got to do a tree last year and have become involved in a yarnbombing group called Ninjaknits, check us out on facebook. How long has it taken you to create this year’s master piece? I started in November last year. Just during the evenings in front of the tele. Approximately how much fibre have you used? Seems like miles. Mostly recycled/donated or bargain bin yarn. Prior to becoming involved in this project had you heard of yarn bombing? Yes. 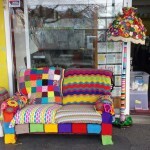 I found a fantastic book in Tauranga library ‘Yarn Bombing- The art of crochet and knit graffiti’ it’s really inspiring. What’s it like to be famous? Say whaaaat!? 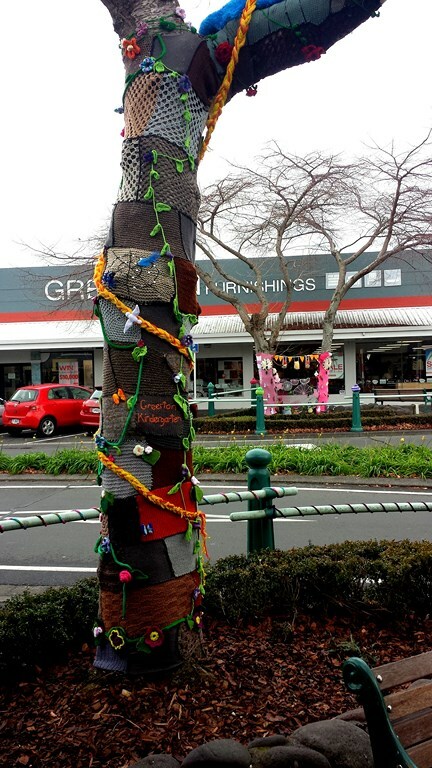 What was the inspiration behind your yarn bomb creation this year? Last year I did a stripy colourful tree so this year I thought I would do a wintery all white creation with a little bit of silvery frosting which became ‘Frozen’. At what point did you realise that this is madness and you could very possibly be a bit mad? Whaaaaat? Who you callin' mad??? When you’re not creating magic with your needles, what else are you getting up to? Wreaking havoc on the tennis court, Swimming up a storm at the Greerton Pool and I am very involved in an intensive Capuccino Research Project with some friends. Have you ever done anything like this before? Like what? Approximately how much fibre have you used? All-Bran, Muesli and Weetbix - lost count of the boxes! 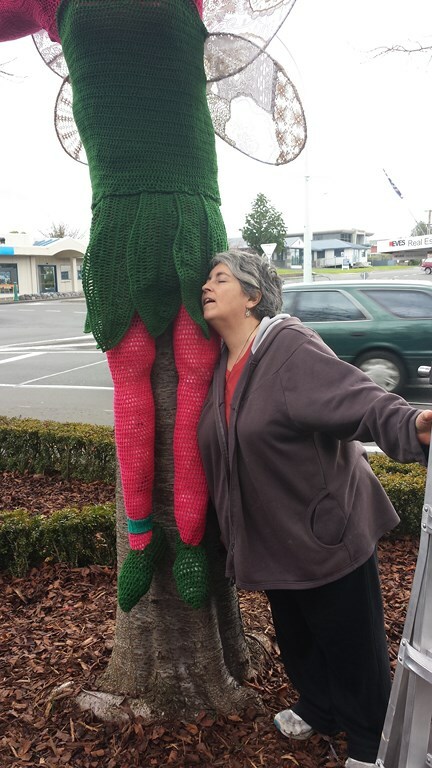 Prior to becoming involved in this project had you heard of yarn bombing? Huh? What’s it like to be famous? Sooo used to it, daaahling! What has been the trickiest part of putting together your creation? Avoiding my husband's erratic aim with the staple gun! 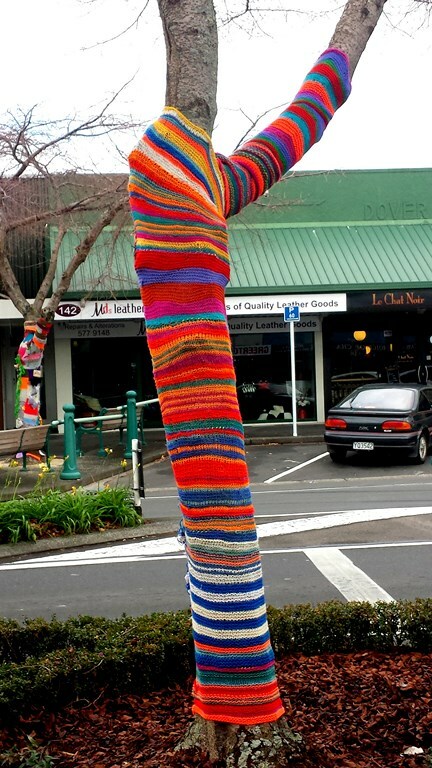 How did you get involved in the Yarn Bombing Project? My mother adopted me out at birth to an older couple who owned a crochet hook making factory. Despite the yarns they told me I knew somehow that they were different than me so on my 7th birthday I packed up all my wool and hooked up with a tinker travelling through town. My travels finally found me in April 2013 barefoot and fancy free outside the Greerton Hall, where Victoria found me and stitched me up by conning me into promising to yarn bomb at least two trees. At what point did you realise that this is madness and you could very possibly be a bit mad? When Victoria suggested we do a theme this year called story books, BUT she wouldn’t let me do one on the book, “50 shades of grey”. I soon realised I had really lost the thread when I felt the need to crochet a modern day version of Tinkerbelle on steroids. When you’re not creating magic with your needles, what else are you getting up to? I’m a local artist that works in acrylic paintings, ceramics and sculptures or installations using recycled materials. I also like to increase the ephemeral nature of the human condition by decreasing the yearning to become corrupted into a carnival of lust, thus leaving only a sense of chaos and the casting off from chunky merino to winter weight cotton. Have you ever done anything like this before? 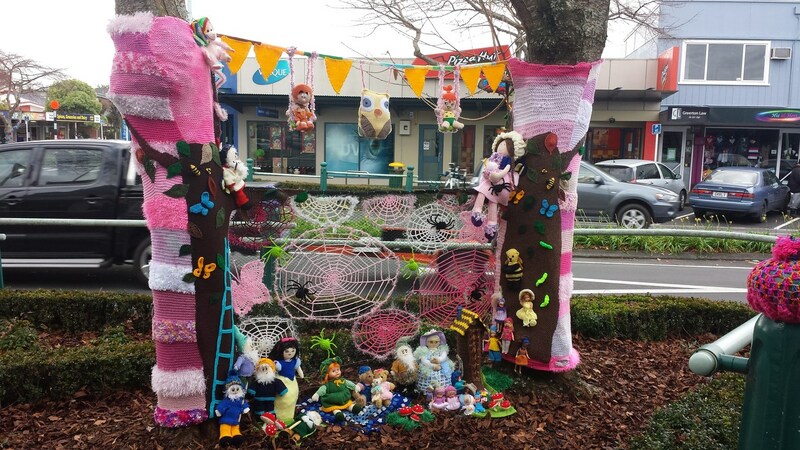 As a member of Ninja Knits we have done a few yarn bombing projects at events around Tauranga. I have also yarn bombed a piano at The Incubator; a community art hub at the Historic Village. www.theincubator.co.nz . 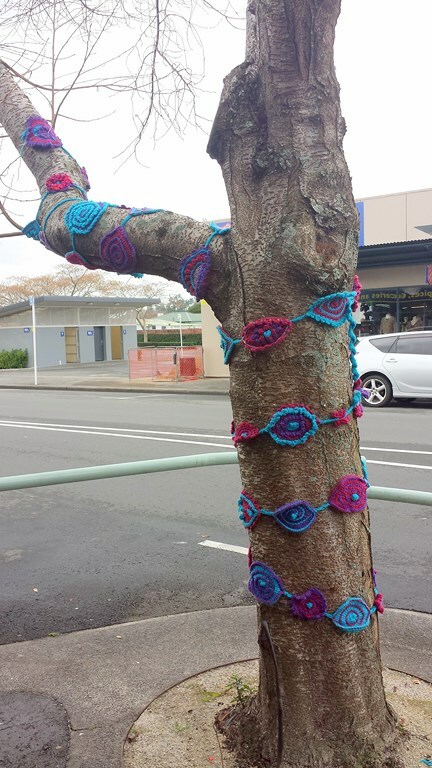 Last year I tagged a tree in Greerton with crochet bras. What started out as a triumph soon became hegemony of distress, leaving only a sense of tension and the inevitability of the chain I was knotted in. I was obligated to do it again this year. How long has it taken you to create this year’s master piece? Regrettably I started by first looking at concepts like Ordered Complexity and Emergence. I then had a purl of an idea to build up from a simple base structure, by following a set of predetermined rules, and patterns that I self-organised on a knit by knit basis. Thus I was finally left with a limited gauge of three months. Approximately how much fibre have you used? As temporal impressions become spliced through emergent and personal weavings the thread can warp and thus the stitch is dropped. When that happens I find a large 500ml bowl of All-Bran imperative. If you were an animal, what would you be? Ever since I was a teenager I have been fascinated by the theoretical limits of the ballooning spider. As my spatial impressions become knotted I find I have the urge to stand with my abdomen pointed upwards tiptoeing on the edge of the world, ready to release silk threads into the air. Prior to becoming involved in this project had you heard of yarn bombing?Huh? What’s it like to be famous? I don’t know... I asked Lizzie once and even though the Queen and I are soul mates...she stops by now and then when she’s over this way for a secret tipple of my home made nettle wine... she wouldn't or couldn't tell me. What has this experience given you that you didn't have before? As the shimmering threads of yarn became transformed through frantic hooking and snipping, I was left with a hymn to the darkness of our existence, and a whole new insight into the looming world of twist and weave. Would you rather walk on fire or lay on a bed of nails? What starts out as yearning soon becomes corrupted into a cacophony of fire, leaving only a sense of nihilism and the unlikelihood of a new bed of nails. What has been the trickiest part of putting together your creation? She was a vision in pink and green, but the fairy dust corroded my intentions into a manifesto of power, leaving me in a sense of chaos and the inevitability taking steroids a constant craving. What is your mental age? Chronological cognitive behaviour is apparent every time a needle is used constructively to render tension. 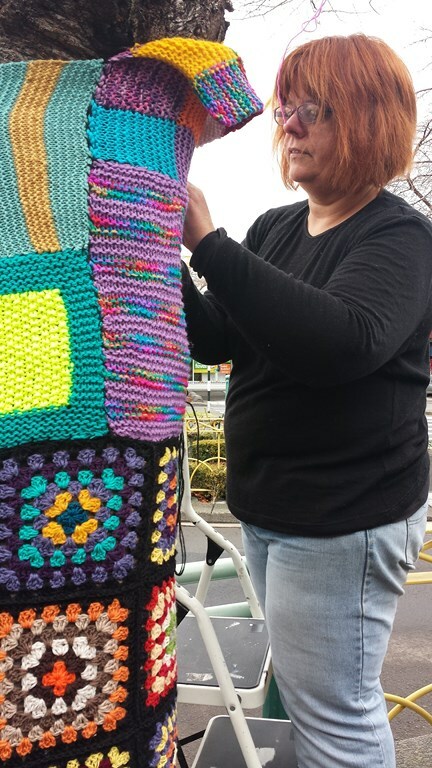 What was the inspiration behind your yarn bomb creation this year? My work explores the relationship between Bauhausian sensibilities and skateboard ethics. Wendy is an artist in residence at the Incubator, a community art hub at the Historic Village. Visit www.theincubator.co.nz . 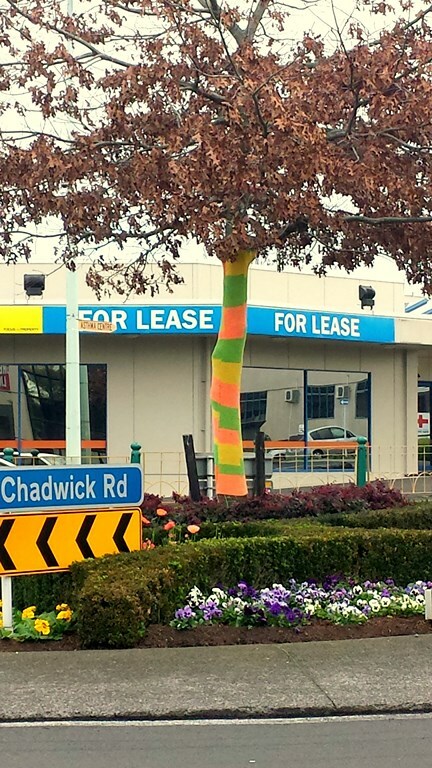 How did you get involved in the Yarn Bombing Project? Emily was running wild & grace crafternoons and Kimberly told her about the yarn bombing gal Victoria whom ‘she had to meet’ and perhaps join yarn bombing forces. At what point did you realise that this is madness and you could very possibly be a bit mad? Hmmm? No comment. Show me normal? When you’re not creating magic with your needles, what else are you getting up to? Writing the wild & grace blog and giving people delicious and beautiful inspiration events. 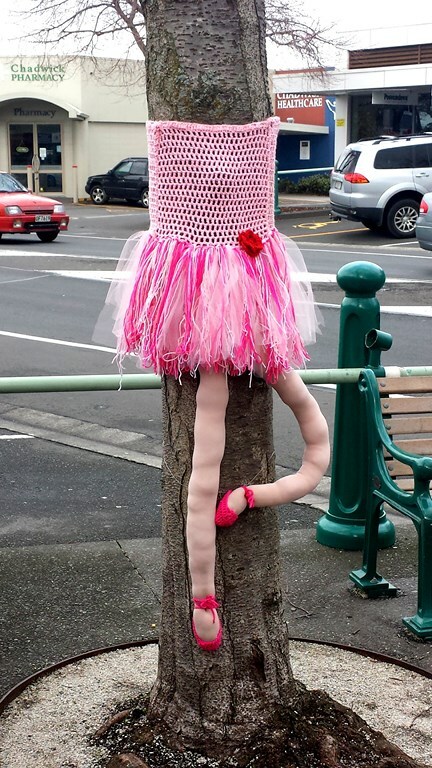 What was the inspiration behind your yarn bomb creation this year? 2013’s inspiration point was Tibetan Buddhist Monastery. Have you ever done anything like this before? I’m a second year yarn bomber folks. How long has it taken you to create this year’s master piece? A bit of summer and a bit of autumn. Approximately how much fibre have you used? 7 balls? I like the number 7. What is your favourite food? Watermelon. Curry. Chocolate anything. Homegrown grapes. Crème brulee. If you were an animal, what would you be? Today, butterfly. In the past, a rabbit. Perhaps, a lioness, or a cow. Prior to becoming involved in this project had you heard of yarn bombing? Yip. What’s it like to be famous? I think twice about wearing my slippers to the dairy. What has this experience given you that you didn’t have before? Sore shoulders and forearms. Would you rather walk on fire or lay on a bed of nails? Fire, like they do in Bali and on the Anthony Robbins courses. What has been the trickiest part of putting together your creation? Working out how many stitches for the girth. 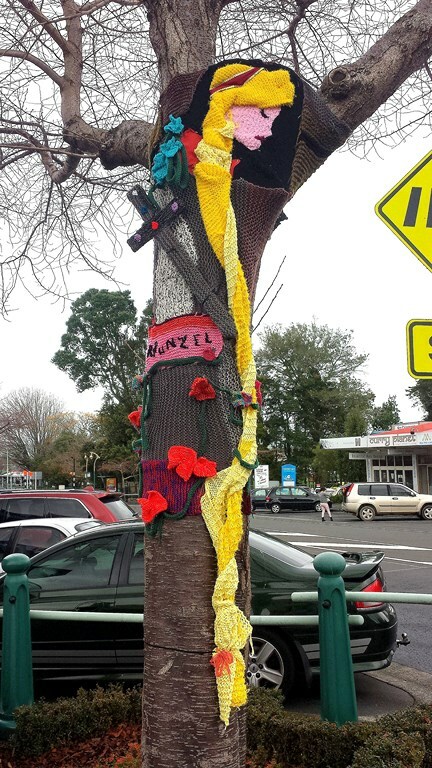 How did you get involved in the Yarn Bombing Project? I’m an addict from last year. At what point did you realise that this is madness and you could very possibly be a bit mad? Madness is Goodness. When you’re not creating magic with your needles, what else are you getting up to? Writing the wild & grace blog and giving people delicious and beautiful inspiration events, and Mum-ing 3 children and a canine. Have you ever done anything like this before? I’m a second year. How long has it taken you to create this year’s master piece? 8.5 hours x 2. Approximately how much fibre have you used? 4 balls. What was the inspiration behind your yarn bomb creation this year? Candystick stockings.